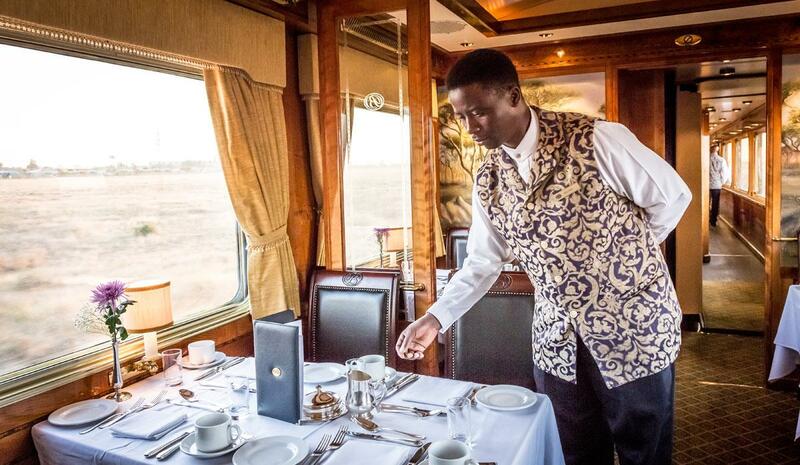 While The Blue Train lives up to its five-star reputation in every sense, its cuisine surpasses even the highest expectations. It could be said that dinner will be the most unforgettable experience of your adventure. On board chefs regularly refresh their menus to intrigue and tantalise your palate, as they prepare their signature dishes using the freshest of local ingredients. 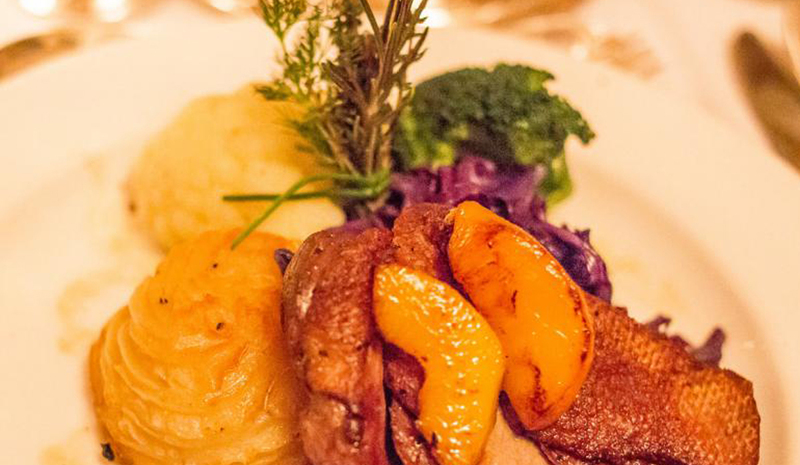 From Karoo lamb, ostrich and venison, to Knysna oysters and other award-winning Cape cultivars. All artfully presented in delicate crystal or on fine china, all contributing to the ultimate experience. Underscoring the Dining Car’s atmosphere is a delightful selection of tasteful background music, ranging from smooth jazz to light classical to the mellow tones of the Soweto String Quartet. As the sky darkens over the landscape, you adorn yourself in your finest silks and satins, diamonds and pearls, tuxedos and ties, as you prepare to relish a banquet glowing with the camaraderie of new friends or dine entwined in the subtle intimacy of a table for two – or even if you opt to dine in the privacy of your own suite – you become aware that every taste you’re about to experience is a memory in the making, a tantalising highlight on a menu of magical moments. And indeed, there’s a menu for every taste. Whether you require Kosher or Halaal meals, or gluten-free vegan options, simply make your needs known at the time of reserving your passage. You’ll also need to reserve your ideal dinner sitting. 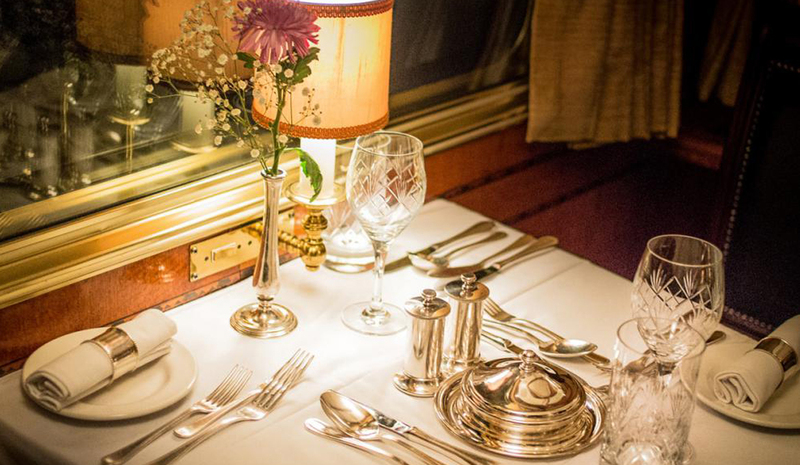 Our very elegant Dining Car comfortably accommodates 42 guests in a single sitting and, in the event of having more guests on the train, meals are served in two sittings to ensure all our guests experience utter luxury and decadence.